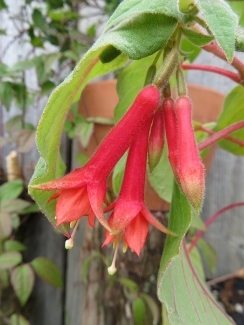 Joy Creek Photo Archive (c) all rights reserved Our thanks to the Elisabeth C. Miller Botanical Garden in Seattle for providing cutting wood for this hardy fuchsia. Showy orange sepals form a tubular case around the orange corolla which just manages to peak out the bottom of the dangling flowers. They nestle above the large, rounded foliage which is very soft to the touch. The leaf petioles are stained coral to complement the flowers. Early summer to frost. 3 ft x 3 ft.